Well, I learned nothing from Monday and my plan to keep our days short while we acclimated to the long summer days. 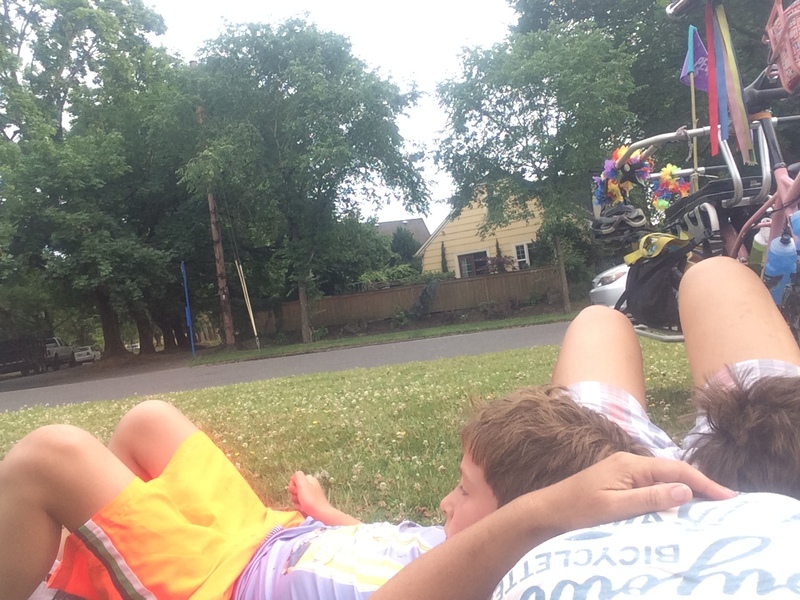 Yesterday we biked 16 miles over 7.5 hours…well, my 11-year old and I biked 16 miles, but my eight-year old biked almost 11 miles before hopping on my bike. 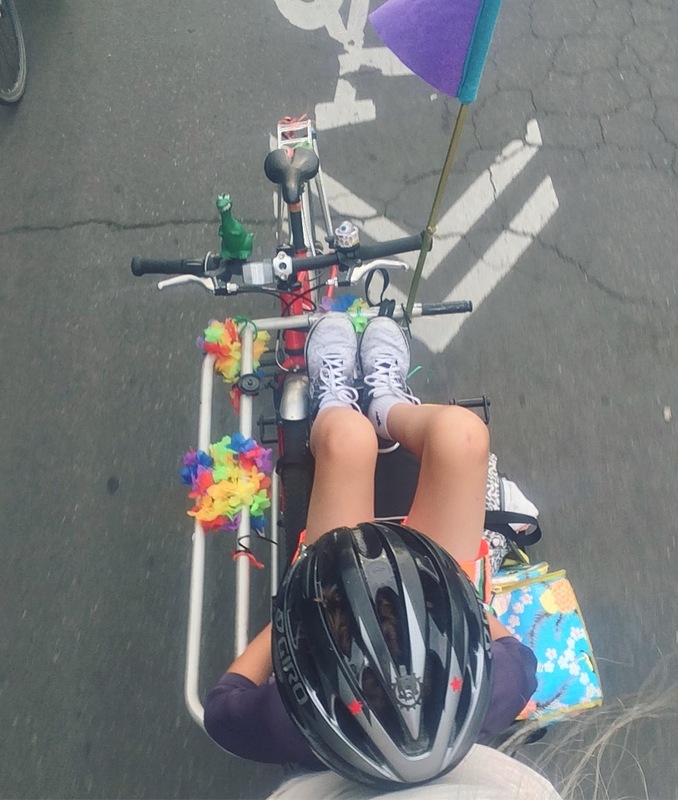 My 11-year old has become such a little workhorse, that I might ride the tandem with his little brother for our next big day and feel safe that he won’t need to be carried at all. I used to pull him behind the tandem on a trailer bike, but he’s a bit big for that now. The temperature would hit 90 degrees so we needed to play in water. 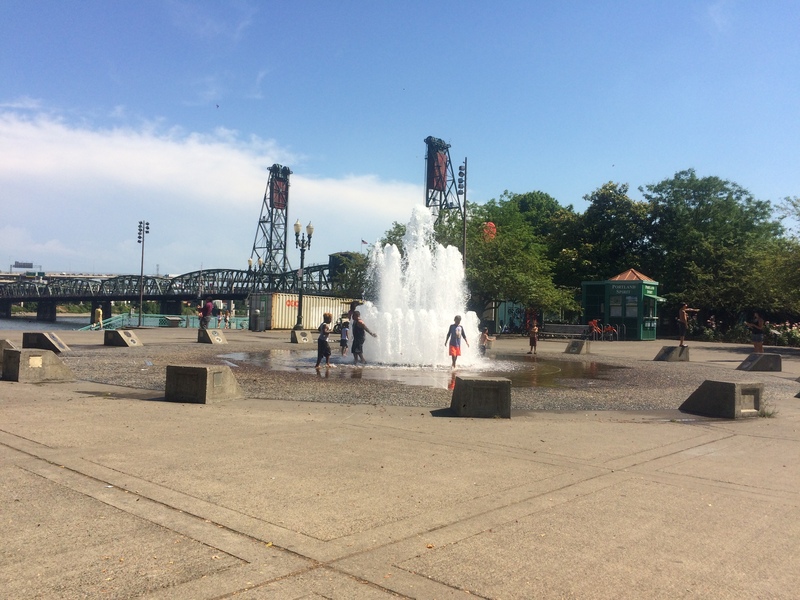 There’s a small spray park by our house, but it’s not all that exciting, plus I really wanted to support the Occupy ICE PDX crowd. We brought our lunch to eat outside the building and discussed current events. One doesn’t need any sort of personal history with Nazis or immigration to appreciate the current horrors, but I was able to explain to my kids that while we personally don’t need to worry about being separated, my grandparents fled Nazi Germany and my mother’s first memory was her father hiding in he attic of their home in the Netherlands. These memories haunted her for her whole life — when her breast cancer metastasized and moved into her brain two years before she died, she began reliving their whispered conversations. I made the mistake of posting to Twitter about our visit and had my first brush with Twitter trolls. Tilikum Crossing is our favorite bridge. And #occupyICEPDX is just 5 minutes from the west end of the bridge so we joined the protest for lunch. It’s hard not to feel hopeless these days; several things in my own life feel tough and out of my control and adding the news (I read the weekday emails from WTF Just Happened Today?, but try not to read too many duplicates on social media lest I get overwhelmed) can make it feel like living under a cloud. After seeing the amazing response to RAICES’ Reunite an immigrant parent with their child fundraiser and adding what I could, and making the decision to visit Occupy ICE PDX, it felt important to share more publicly, on Twitter, but I’ll stick to more quiet support again. However, I’m incredibly grateful for the more outspoken fighters out there. After lunch with the protesters we visited Poet’s Beach. I’ve been a few times myself, though never when the river was low enough to reveal the sand, and the kids had never been before. They loved the poetry. Actually, too much. 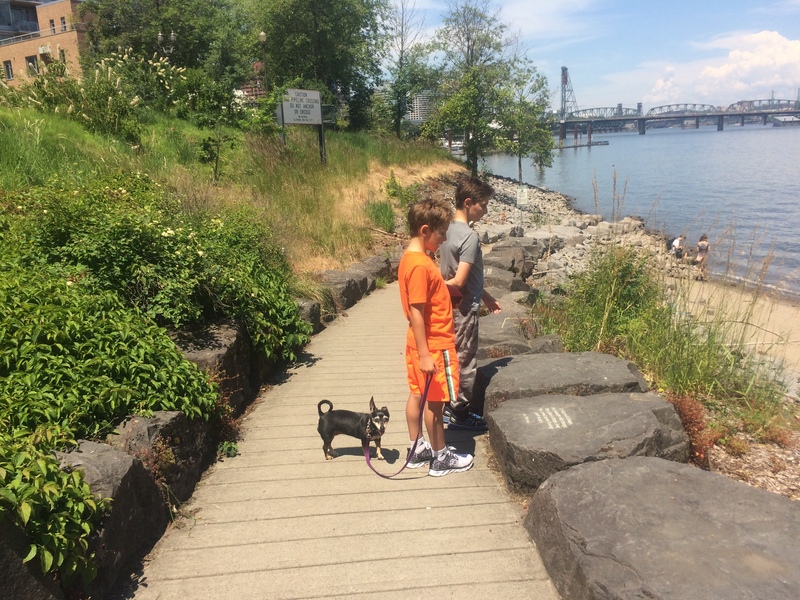 It was so hot out and they had to stop and read every rock on our way down the trail before I could run under the shade of the Marquam Bridge. A guy walked his Big Dummy down to the sand to keep it near him, but we locked up at the racks above the beach and our bikes were undisturbed. The racks were in the shade for our whole visit, too. Since we had a long ride home and it was still hot out, it seemed wise to swing by a spray park to remove all the sand next. The kids remembered Salmon Street Fountain from the Kidical Mass PDX bridges ride two years ago. They still love it. 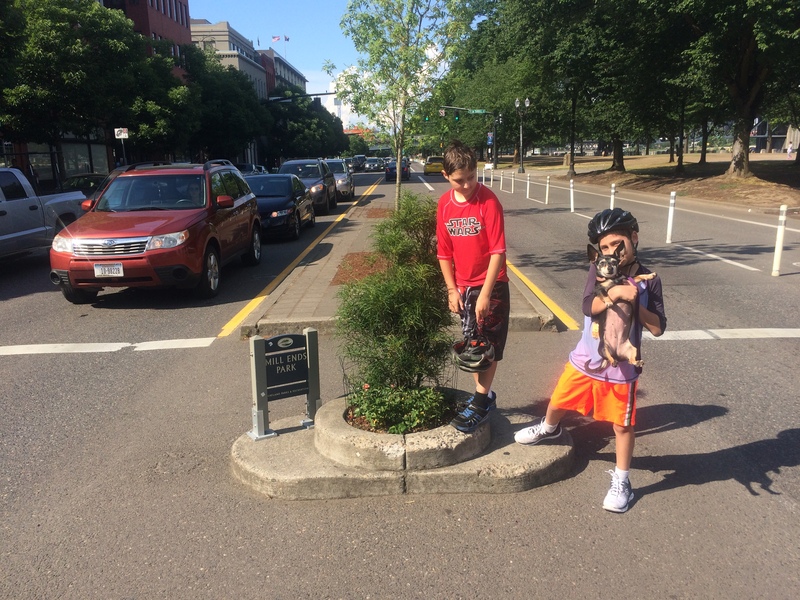 Since we were just a block away from Mill Ends Park, the smallest park in the world, and it has a new sign, we stopped by there to visit. The kids were hungry again so we opted to take the Hawthorne Bridge and go to Cartopia Food Truck Pod. Food truck pods are so convenient when we have Pixie in tow. And when the kids are so hungry they end up eating from two different trucks each–options! I was relieved to find water at Cartopia as we hadn’t happened upon any drinking fountains and were just about through our six water bottles by then. 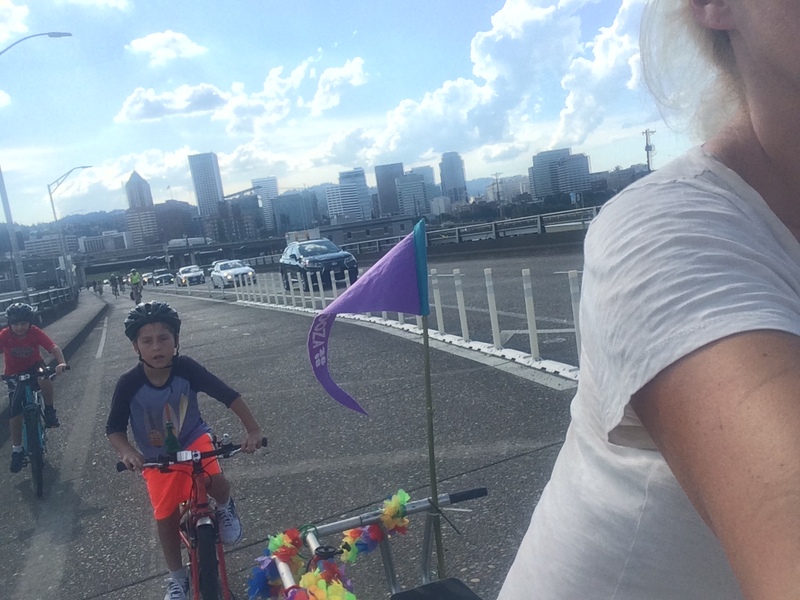 I don’t usually ride the Hawthorne Bridge with the kids, I try to stick to Tilikum Crossing and the Steel Bridge since there are no cars. 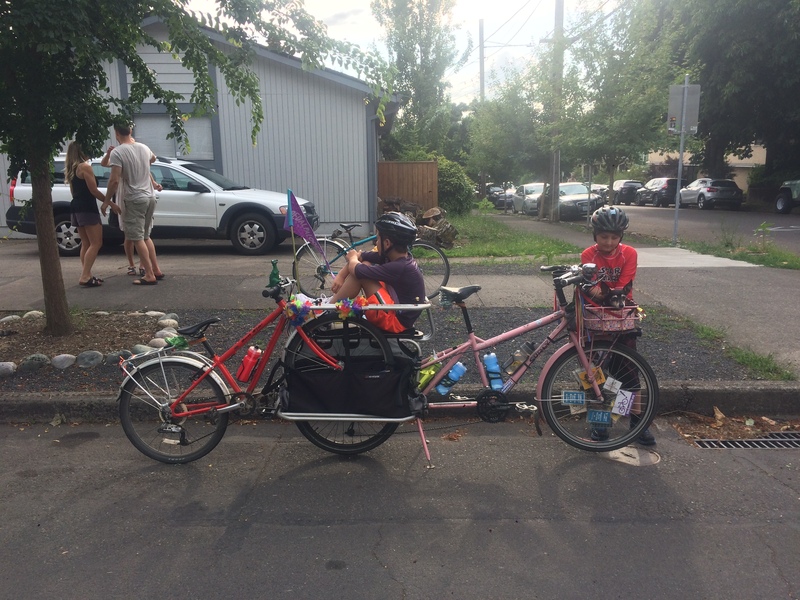 But they did great and my little one loved the bike passing lane on the second half in the street…though he didn’t utilize it to pass me. We didn’t get far after eating and took a rest break in Ladd’s Circle. Then just as we started our slow ascent I got the “Mama, I need a lift!” request. I’m pretty sure a headwind hit us just then, too. Or maybe I was just tired. Or both. I’m relieved it’ll be cooler for a while now and I’ll try again to work on gradually building up our summer hours.